Time and again, over the last few months, I've preached about measuring distances in time. Sometimes, it is better to take the advice of someone in the know of things than make foolish decisions about places you don't know. I was in Trivandrum for a conference and I had to keep a 10 year old engaged. I had promised him a trip to Kanyakumari (Cape Comorin) so the second day of conference was set aside for it. 87 kilometers from Trivandrum to me was a 2 hour drive logically and since I wasn't going to be at the wheel I thought it would be faster! 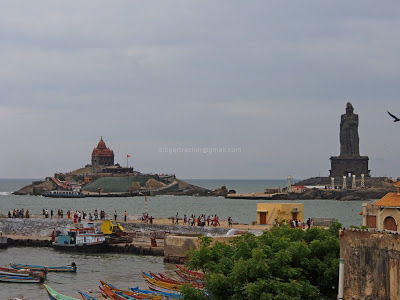 I wanted to go to Kanyakumari do the usual trip to the Vivekananda rock and also see if I could do Padmanabhapuram palace, Suchindram and a couple of other temples and a waterfall. The total distance would not be more than 250 kilometers and I was sure a leisurely start after an early breakfast would see us back in Trivandrum for the Banquet in the evening to be hosted by the organizers of the conference. The taxi driver called up to tell that if we were to do the entire program, we'd have to start at 6.00 AM and would only be back by 10.00 PM! I did not go to Trivandrum to get hauled out of bed at 4.30 AM. Hey! I find even 5.30 AM unearthly! I told him we'd leave after breakfast and do what ever we could in 12 hours. I have maintained that NH-47 is a nightmare and my feeling were reinforced on that day. The taxi driver had told us it would be an endless traffic jam all the way to Kanyakumari and he wasn't wrong. There was a KSRTC bus with a punctured front tyre on the railway overbrigde near the Trivandrum station. Five minutes into the trip and we were caught in a seemingly impossible situation. It took some 20 minutes to get past the jam and I was getting a bit annoyed. My driver said that there was a route through Kovalam and Poovar that could help us avoid the traffic at least part of the way so we took the road he suggested. I consented grudgingly because I was responsible for the immediate situation. That route was only slightly better; winding and narrow, overtaking was nearly impossible so we were part of a long line of vehicles that crawled like a toy snake. Every now and then a vehicle would pop out of the line like the toy snake's section, only to quickly return to it's rightful place, as an oncoming vehicle would ensure it could not jump the queue! Three hours into the journey, at 11.45 AM we had reached Thuckalay, some 50 odd kilometers from Kanyakumari. The Padmanabhapuram Palace, the home to the rulers of the erstwhile Travancore was located here. 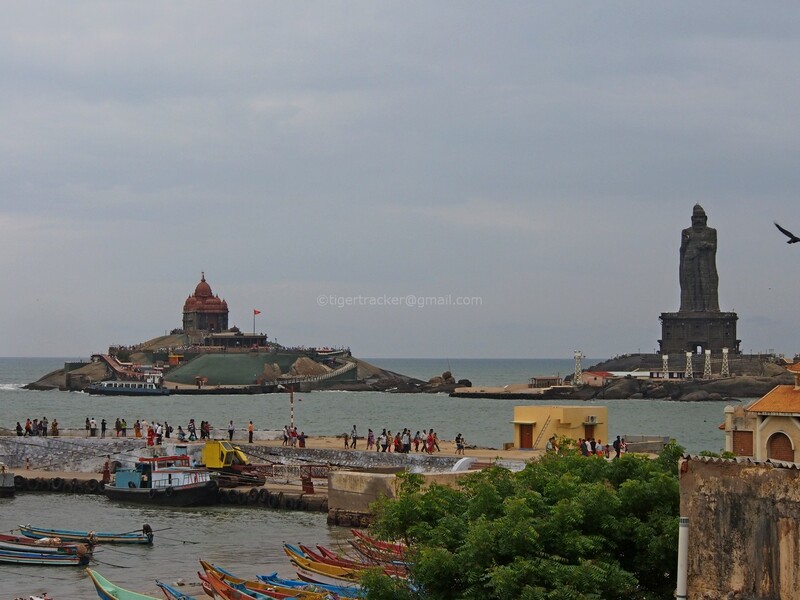 After the reorganization of the states in 1956, Padmanabhapuram became part of the Kanyakumari district of Tamilnadu. Perhaps, politicians those days were more magnanimous; the administration of the palace was retained by the Government of Kerala. However, the income and expenditure are shared equally by the two states. Amazing cooperation! Since walking through the Palace does not qualify as Woodcrawling I am posting a blog on the Padmanabhapuram palace in Mango Musings as a series. This is an awesome palace with fabulous woodworks. With wood everywhere, I feel you can very well this a woodcrawler's journey.